Volunteers also need to put out deckchairs on each date from 2.30pm and put them away afterwards from 4pm. For all summer fete, volunteers and donation queries email below or phone Caroline 020 7326 1042, Mary 020 7274 4756 or Doug 020 7733 5018. Looking forward to seeing you at the fete! Categories: Community, Events, Friends of Ruskin Park | Tags: Friends of Ruskin Park, summer fete | Permalink. 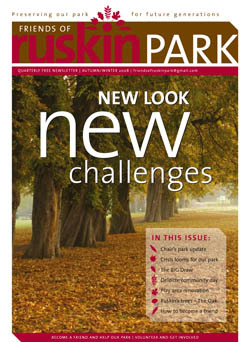 I’m delighted to upload the latest newsletter from the Friends of Ruskin Park. 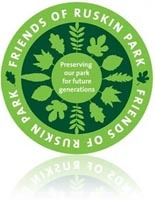 Categories: Community, Friends of Ruskin Park | Tags: Friends of Ruskin Park, newsletter, ruskin park | Permalink. The next public meeting of the Freinds Of Ruskin Park is on 13th November at St Saviours church hall, Finsen Road 7.30pm where the Chair gives an update of park matters and people can comment on and discuss park issues. The main issue is Lambeth’s lack of care of the park due to park budgets being slashed and money for projects taken for other expenditure. People need to complain to their Councillors or Lambeth Parks directly. Please write to the councillors below, the care and maintanance of Ruskin Park affects us all, currently the park needs funds to continue ongoing work on the bowls green, the tennis courts, playground, the stable block and general maintanace of the park itself. The Friends ORP are aware from verbal conversations with Lambeth Parks staff that money that was there for park projects is either no longer there or has been reduced, e.g. the bowling green planting. They believe it has been used to cover budget shortfalls elsewhere, but where they do not know. Why Lambeth feel the need to do this or what state their overall finances are in the Friends don’t know either. The Friends know that there is a budget freeze on all but essential park maintenance, i.e. where there are health and safety issues. To find out more come to the Friends public meeting or see the next newsletter due mid to late November. Categories: Community, Friends of Ruskin Park, Main | Tags: Friends of Ruskin Park, loughborough junction, ruskin park | Permalink.